I ordered two skeins of Anchor Bay yarn from Webs for the toddler cardigan, I was delighted to cast on Wednesday night and have solely knit on this project. I'd love to finish this cardigan within a week or so. Easy! How was your week? Our son has been here for his spring break, so my mornings have been either working or going to the gym and my afternoons have been doing something with him while he is here. We've had lunch out one day, gone shopping locally and then there is just sitting and talking. I'm not sure when he leaves, either Saturday or Sunday. My intention this week has been to 'be in the moment'. I've been successful most of the time. Part of the success is to have no expectations whatsoever. I'm keeping up with the kitchen dishes and am valiantly ignoring the coffee table mess. (dare I say the mess isn't so bad?). Okay, I have a confession. I am yearning for spring - there I said it. I have been on two walks and wasn't fully wrapped up in warmth - I was cold and I was wishing for light jacket weather. Outside my family room window is a bluebird who chirps at 6 a.m. Holly loves it and so do I. The only signs of spring on my walk are the cardinals and robins singing. Just think, we've only a few more weeks until the blossoming occurs. I'm ready. Holly loves to hide behind the blanket while under the loveseat. She does sneak attacks to whomever walks by (including Frodo). We find it hilarious, Frodo is overall confused. He usually is the pursuer and doesn't quite know what to do when he is the target. Holly is becoming skilled at sneaking around when Frodo is sleeping. If Frodo knows she is walking about there is a cat chase. However, the barking is a little less. Frodo is NOT fast enough or smart enough - she has him out skilled with her youth and agility and speed. Because spring fever is in my mind, I've been reviving the 'salad a day' on the menu plan. Just another change that reminds me of warmer days ahead. Lately, I've been enjoying sunflower seeds, radishes and a chopped hard boiled egg on my salad. What are your toppings? Any new ideas for me? I have a yarn review blog post for next week that I'm excited to share with you all. Also a few surprise posts later in the month. I hope spring is arriving wherever you are!! That's a lovely color for that cardigan! I sometimes feel like I cheated by spening most of winter in Curaçao. We arrive back home the 21st and while everybody will be celebrating spring, we'll probably be tempted to whine about the cold and the darkness (but I'll try to retain myself). It seems Holly and Frodo are working it out together. Our first cat James was small and not very strong, but he made friends with almost all the dogs in the neighborhood. He even went out daily to go on walks with them. There was one (giant) dog he wasn't friends with, but that one was afraid of him after a little fight they had (James scratched the dog on its nose - very painful, but it worked like a charm). 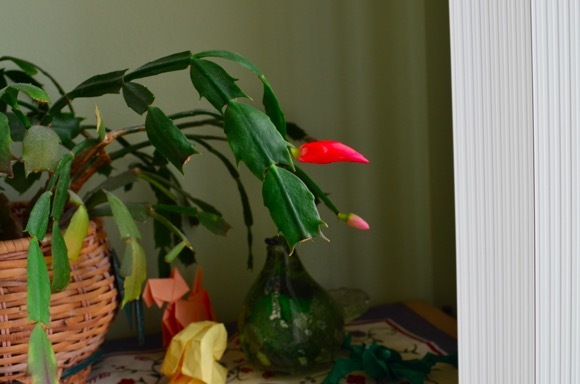 I used to have a "Christmas" cactus that always bloomed at Easter! I am loving the updates on Frodo and Holly - too funny. Lovely spring sock - what is the yarn? And the cardigan will be gorgeous. 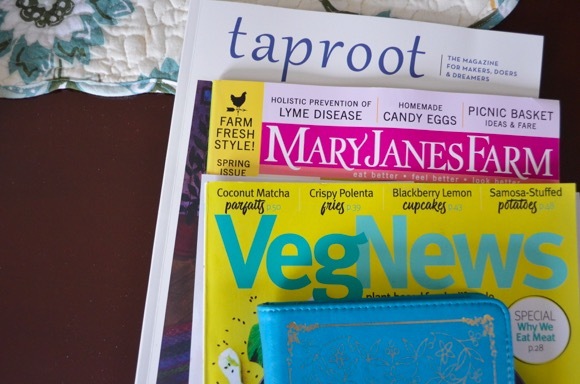 Gosh - I had forgotten all about Mary Jane's Farm...I used to subscribe and then let it go. I am going to check that out again. Have a great weekend - enjoy what time is left of your son's visit. 11 days and counting! :) I am so looking forward to green leaves on the trees, flowers, and green grass. This brown and grey of winter begins to get depressing! LOL! Sound like your home is a fun and relaxing place to be right now. Love the purple of this little cardigan! you amaze me with the speed that you get a project completed. Hope you have a great weekend! Oh, btw, I don't eat much salad. It causes bloating for me... js. Oh my, Karen! 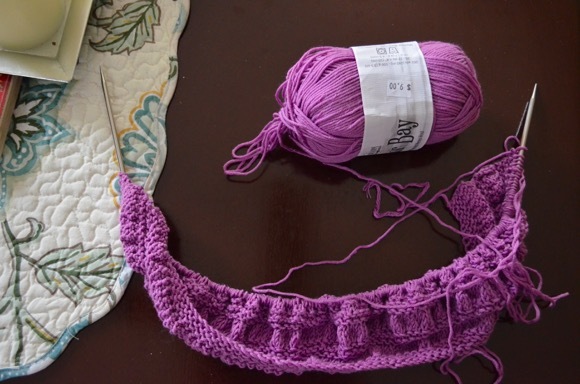 That cardigan for your sweet one which you babysit is going to be absolutely gorgeous! 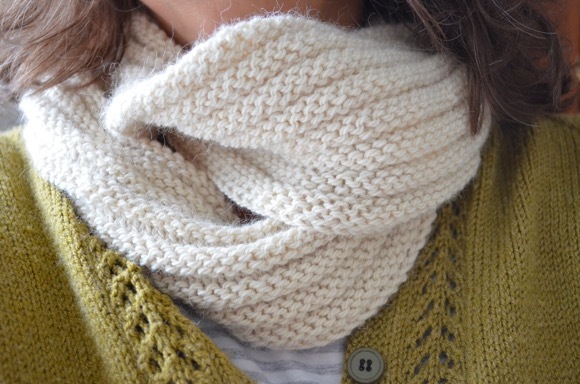 I LOVE the color of yarn and the texture looks amazingly soft! Spring will be here before we know it. 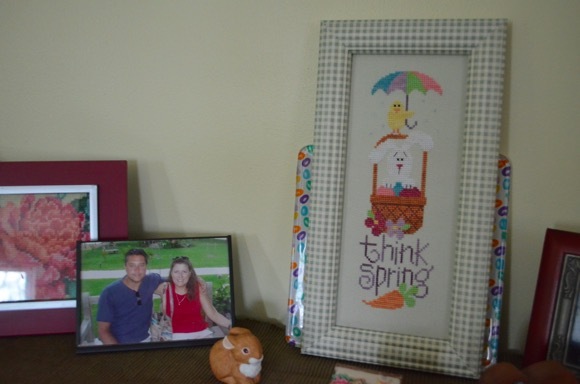 Seeing your little signs of it around your home makes me want to go get out my spring things...but it will need to wait a bit because I am in the middle of painting the mudroom. What a riot Holly is. Sneak attacks; that made me smile. 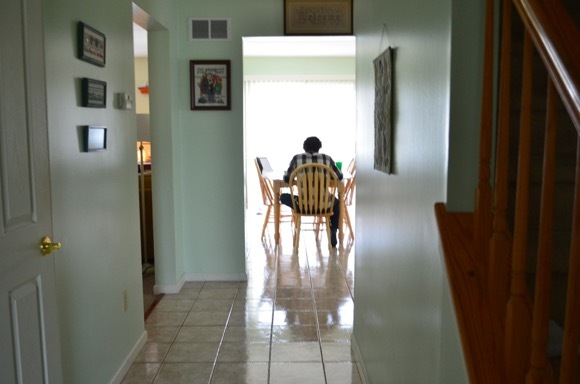 I'm glad you're having a lovely visit with your son; I'm sure he loves being home, reconnecting with his mama and getting sage advice while eating home-cooked food. Oh boy that new yarn is like marshmallow Peeps! Your spring picture is lovely, to bring a smile to your face in the depths of winter and to remind you that spring is not too far away now. I smiled at the antics of Frodo and Holly, a cat will usually always outsmart a dog :-) Your new yarn is beautiful. Glad you're having a good time with your son. Lovely color yarn for that cardigan. I am so over winter right now! And I usually do not mind the cold. Yay for bird chatter ! I hear more and more of it here, too, and thoroughly enjoying it. I like to have a few raspberries and a raspberry vinagerette that I enjoy making. Pecan nuts is also a favourite. 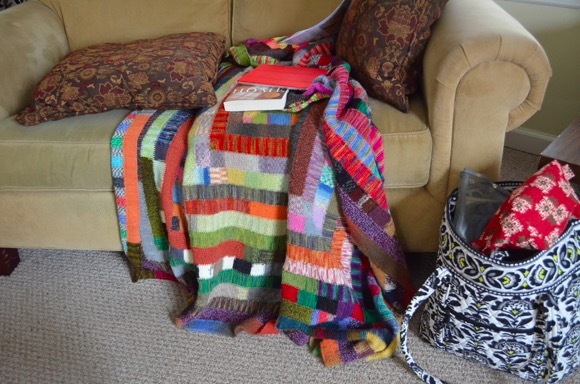 Love that your knitting is season-appropriate! I'm all about the avocados on my salads ... it is definitely a sign of warmer weather when we can have a meal without anything hot. Happy Weekend! That purple yarn is so pretty. Isn't it nice to have your son home for Spring break. I totally agree with you that I want some warmer weather. We still have some snow on the ground with temps in the 40s during the day and going way down to the 20s at night. Brrrr. That blue sock reminds me of robin's eggs. Very spring-like! I like to top salads with craisins and cut-up snap peas. I'm one of the few who dreads spring. I just adore winter! Our weather has been so screwy our Christmas cactus has a bud on it too. Only one though. Love your sock! Very spring-ish. I am so looking forward to Spring... Nice blog! My Christmas cactus has about four blooms this week. It must be the light. 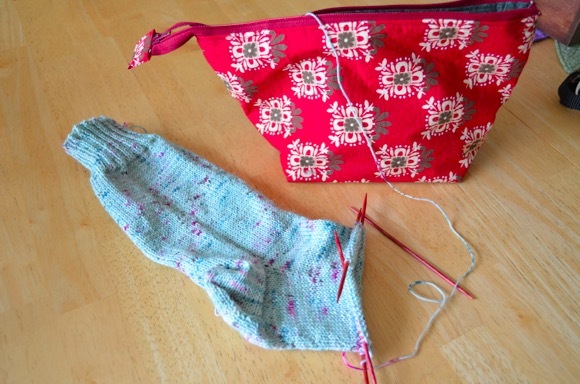 Your knitting looks very Spring like between the toddler cardigan purple and the cheerful sock. Salad toppings - slivered almonds, dried cranberries, sometimes a few slices of orange when store tomatoes taste like cardboard. It sounds like a lovely weekend with your son at home. 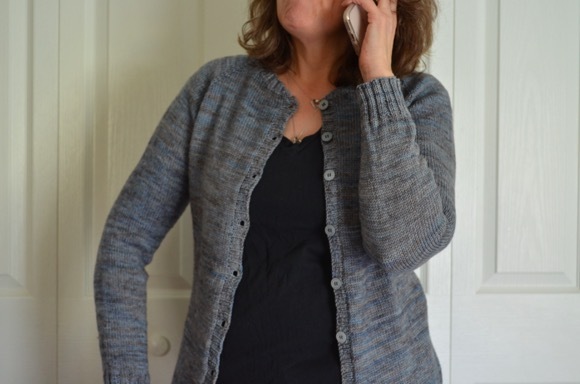 I love the color of this cardigan, Karen! Definitely no spring here, and no signs of it either. Everything is covered with too much snow! I love dried cranberries on my salads. So yummy!